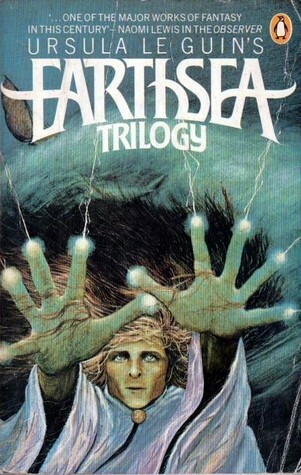 If ever there was to be a queen of science fiction/fantasy, then surely Ursula K LeGuin is a strong candidate! Now 83 years old (to the best of my knowledge), she is most certainly one of literature’s treasures. I came to her works when I was given a copy of Earthsea, a compendium of the first three tales of that remarkable fantasy masterwork. 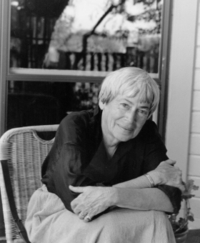 Ms LeGuin (I apologise if she prefers the title “Mrs”), managed to both captivate me and give me nightmares! The impact of those three tales was immense. They are unforgettable and as such, I can only reread them occasionally, after a long gap. Sadly, considering her stature, it is surprisingly difficult to obtain her books here. Of the many, I have only been able to read those tales of Earthsea and her novel The Left Hand of Darkness. Despite that, I have to list Ms LeGuin as one of my firm favourites. One thing has always puzzled me, and that is the fact that my local library insists on placing Earthsea in the children’s section. I see no true merit in that. It is a work for a wide age range and there are portions that I would consider rather risky for younger children – they frighten me, for goodness sake! I know that Ms LeGuin is regarded as a writer of science fiction, fantasy, children’s books, YA (young adult) and poetry, so I can only assume that this creates an insoluble problem for librarians. It would be a crime, however, if these arbitrary classifications of excellent literary works meant that some either missed her works entirely, or made assumptions that were false. Ursela K. LeGuin is a fantastic writer. In my Eng. lit classes, I had my students read her short story, “The Ones Who Walk Away from Omelas” to focus on symbolism. She is a writer that deserves attention! But yes, Ursula K LeGuin is highly deserving of far more exposure!